The story of Radio B’s pirate broadcasts in the 1970s has been all but lost until now – in part because the pirate adventures were officially nothing to do with B at the time – but they played a remarkable role in the culture of New Zealand radio, and in the changing culture of the country itself. They also had a lot to do with Radio B itself finally getting to air. 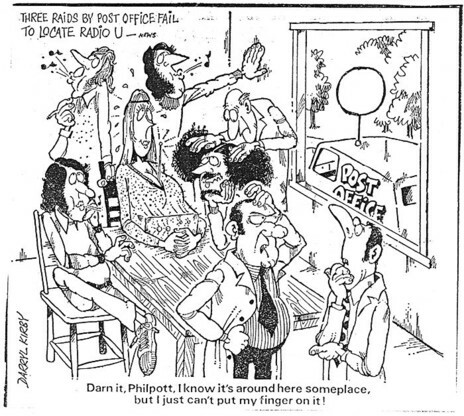 After its debut, broadcasting from a boat as a capping stunt in 1969, Radio Bosom settled down and contented itself with delivering “radio” via a network of speakers installed in the quad and around the campus. AUSA submitted several applications to broadcast a low-powered signal to the nearby halls of residence, but regulators didn’t budge. Discovering a door with an on-air light above it, the inspectors entered to find a room full of turntables, microphones and records. The student there explained that he was merely running the university’s internal broadcast system (aka Radio Bosom), which was in no way associated with the pirate broadcasters. The inspectors rightly had their suspicions, but were obliged to leave after they were unable to detect a radio signal. All the while, the crack Post Office team was searching the Student Union building. When they go too close, the transmitter would go silent and the “small black box” they were carrying lost the signal. The inspectors came three times in 12 hours, but could not find the transmitter. The inspectors declared that any subsequent visit would be from the police, alarming the station’s “board of directors”. Jonathan Schwartz, who was said to fancy a legitimate broadcasting career, went on air to declare that, after receiving a call from Wellington from someone who addressed him by his real name, he was pulling out. But the decision was swiftly reversed and Radio U went back to air. Not long after, the studio telephone, which had received hundreds of calls from well-wishers, rang again. It was the Minister of Broadcasting, Bert Walker. Mr Walker congratulated the students on the quality of their programme – but warned that they were risking their chances of obtaining a temporary licence in future. And so it was, after 45 hours on air, that DJ Sunshine Superman thanked Aucklanders for their support and Radio U signed off. The last song played was ‘God Defend New Zealand’. 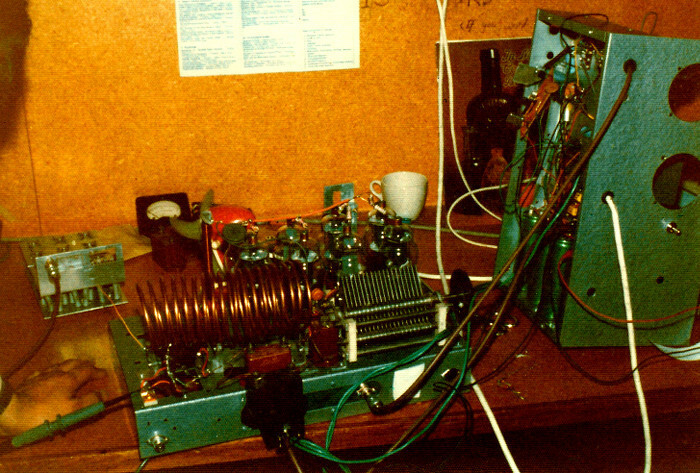 A radio transmitter in the process of being assembled for Radio Bosom by the radio club in 1973. The chassis is thought to be from the transmitter used for the original Radio Bosom sea-going broadcast and may have been used for early Radio Active broadcasts in Wellington. Encouraged by the friendly call from the minister, students set about applying to the Broadcasting Authority for a 10-day broadcast warrant to publicise a festival organised by the universities’ arts council for August. The New Zealand DX Times, the journal of the country’s radio hobbyists since 1948, was supportive and believed the students had an excellent chance of approval. The students’ application was declined. It was not the last time commercial broadcasters, founded in the name of radio freedom, would line up against the B. But as they prepared to seize the equipment, three borer bombs were thrown into the tunnel, filling it with smoke. On 20 August, Radio U began broadcasting illegally again. The Post Office inspectors returned – and this time they were more successful. After following a wire down from the roof of the student union building the inspectors located a transmitter behind a brick wall in a tunnel underneath it. But as they prepared to seize the equipment, three borer bombs were thrown into the tunnel, filling it with smoke. “The inspectors took it all rather well, considering,” a student spokesman told the Star. Meanwhile, minister Walker was questioned in Parliament by Labour MP Bob Tizard. Had he in fact given the students an undertaking in May that they would get a temporary licence? No, the minister insisted, he had merely advised them of the penalties they faced for broadcasting illegally and told them to apply in the proper manner. Worse, when they went to pursue the students with the transmitter, they discovered that the tyres of their Post office van had been let down. 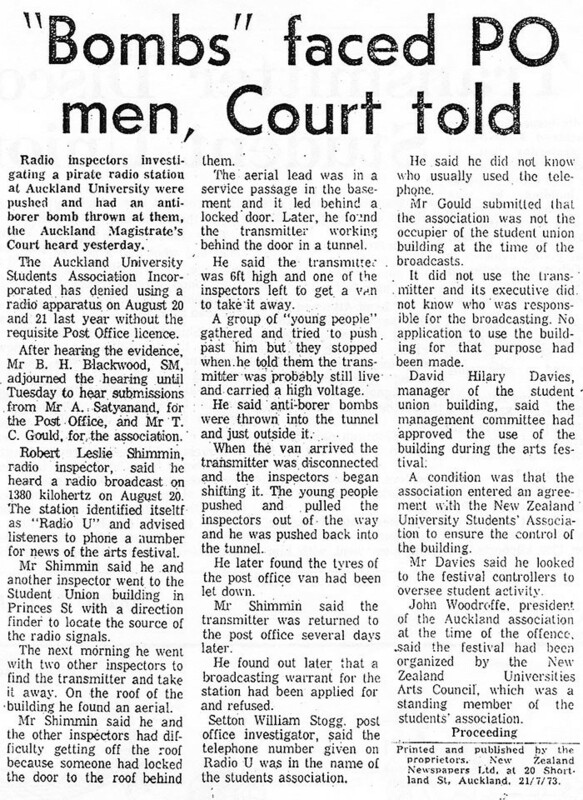 Eventually, the argument of AUSA’s lawyer – that the student union building was substantially under the control of NZUSA, not AUSA, at the time of the pirate broadcasts – prevailed and the prosecution failed. In all this time, the identities of the student pirates were never revealed. What was their story? How had they pulled it off? “Jonathan Schwartz” was actually Glenn Smith, the manager of the officially unconnected Radio Bosom. A radio obsessive since childhood (while at school, he won a competition that gave him an afternoon show on 1ZB, where he chose his own music, an unprecedented half of which came from New Zealand artists), Smith did indeed go on to a professional radio career – all of which has been at the steadfastly independent 1XX in Whakatane. There was another tricky conversation: with his mum. Another of those involved was Robert Gordon, who recalls that the pirates installed a switch in the Radio Bosom studio, allowing them to turn off the source of the source of the broadcasts – a tape player down in the basement locker room, which was in turn connected to the transmitter. They also did their best to disguise the connecting wires and the aerial on the roof. Gordon says the inspectors initially tried to park their van in the basement carpark next to the student union building – but were refused entry because they lacked the correct sticker. They then summoned some plainclothes policemen – who promptly got lost. The inspectors sought out a map of the building. The service tunnel was accessible from the former café on the ground floor of the building and from the carpark. Again, considerable effort – including the bricking up of the tunnel – went into concealing of the transmitter. 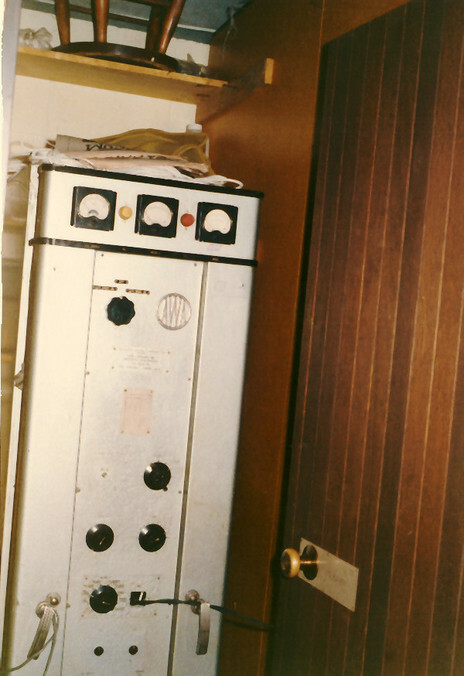 The Collier & Beale radio transmitter that was removed by Post Office radio inspectors from the services tunnel during a pirate AM broadcast. The Post Office eventually returned the transmitter and it was used it for all subsequent Radio B AM broadcasts. Technicians had to tap the valves with a ballpoint pen for them to work properly when the transmitter was switched on. If an arc formed, the technician received a shock. It was a stroke of luck that the night before there had been a gig in the café. The pirates, realising that that the inspectors had found the transmitter and were breaking down the brickwork, asked the driver of a hired van loading out gear from the café to help. News reports at the time said the transmitter – a big piece of marine kit, all of six feet high – was “returned” to the Post Office several days later. The reality was a little more complex, says Gordon. It was successfully hidden at the Herne Bay home of Chris Cotton, which had been the location for pre-recording of programmes. “Ultimately, the police started putting a bit of pressure on the guy who had rented the van – they’d stop him in the street and search him for marijuana – so he came to us and asked whether we could do anything about it. So we agreed to hand over the transmitter. Less than a year after the court case, everything changed. The Kirk Labour government had scrapped the existing Broadcasting Act and abolished the Authority and in February 1974, Radio Bosom was granted a licence to broadcast for three weeks in March. It was the first licence to non-commercial pirate radio, the first to a university and the first short-term licence. Walker, by then in Opposition, subsequently lamented that the licence had gone to the students and not to the would-be Christian broadcaster Radio Rhema. But it may be that it was his friendly phone call to the pirates that set it all in motion. It was not, however, the end of the pirate adventure. While happy to finally be legally on air on the AM band, the students turned their attention to FM – which the government was steadfastly refusing to introduce. 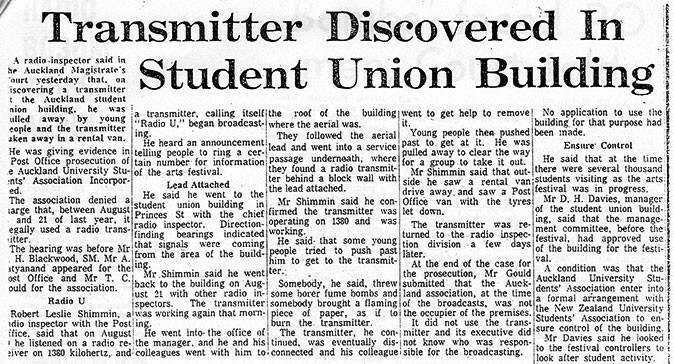 FM broadcasts were made as Capping Radio from the Radio B studio via an aerial on top of the Chemistry building. More regular broadcasts as Radio Auckland were pre-recorded and delivered on Friday nights from the top of the former ASB building in Queen Street. The pirates had a campaigning agenda and in 1977 they even set up an FM transmitter and broadcast in Wellington to bring the protest closer to the politicians. While Radio Hauraki’s management was doing its best to prevent Radio B getting on air, some of its announcers took quite a different view. The $250 transmitter was surrendered but the pirates were never caught. They retired undefeated. The broadcasts ended as the pirates moved on into the world, but there was a pirate “reunion” in 1980. By this time, the pirates were slick. On the Thursday before Easter, they donned overalls and posed as maintenance workers to plant an aerial and transmitter on the roof of the university’s chemistry building. A second transmitter was placed in a van to deliver to the North Shore. Friends acted as operators on six phone lines and took more than $1,000 in pledges for several charities. And, finally, a mixing desk was set up in the bedroom of a flat in Newton, disguised so it could be passed off as a sophisticated home stereo. Jocks from both the NZBC and the private stations came to take turns on the midday-to-midnight FM broadcasts. It took until Easter Monday for police and Post Office inspectors to find the transmitter – and as they did, the pirates, who had been watching them all along, shut down their studio by remote control. The $250 transmitter was surrendered but the pirates were never caught. They retired undefeated. But this was not the end of Radio B’s role in the FM radio story. In the 1980s, the station would again take a role that upset the establishment.